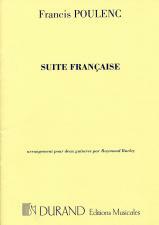 SUITE FRANCAISE by Francis Poulenc, arranged for two guitars by Raymond Burley. Subtitled 'Apres Claude Gervaise (16e siecle)', this seven-movement work is found listed in Poulenc's catalogue as being written for nine wind instruments, percussion and harpsichord, and also for piano solo; which came first however I am currently unable to ascertain. Whatever the answer, you know with Poulenc that what you see is certainly not what you get, even if it does have reminiscences of the 16th century in it! A Bransle de Bougogne opens the proceedings and bounces gracefully along. Everything is witty and fun and the odd acidic little harmony here and there is very typical of the man. Both parts stay firmly grounded in the lower positions for the first half whilst the second section beginning at letter B has only the odd excursion into higher positions. A humorously abrupt close is marked 'not to be retarded'. A serious Pavane largely moving in chords is next on the scene. Again the harmonies are noticeably modal in character and the entire effect is one of peace and tranquillity. The Petite Marche Militaire that follows roughly breaks the mood. The first portion is in four-part harmony and bounces along full of staccatos and heavy accents, whilst the next section uses a certain amount of quartal harmony to make its effect. This leads to a repeat of the opening section and a very surprising ending wherein the piece, supposedly leading to a cadence in C Major, suddenly closes on two sforzando D Major chords, a laugh out loud finish if ever I heard one! A short Complainte follows. It is melancholic and somewhat enigmatic in content, the harmony work being strange and elusive. It's 6/8 movement rolls along creating an air of mystery before closing on an indefinably odd chord. The 5th movement is a Bransle de Champagne, which dances along amiably reaching an impressive climax before returning to the opening idea and closing on a slightly off kilter set of octaves with one lone B creeping in as if by accident. A sweetly harmonised 6/8 Sicilienne is next with some impressively chromatic harmonies entering around section B. The final Carillon is marked Tres anime – tres gai and so it is . . . in abundance. This is a fine conclusion to a simply glorious piece of music I have never set ears on before, more pity me! This works really well on two guitars. It is only of moderate difficulty and is substantial enough for the most rigorous of audiences, yet throughout retains an individual character that keeps you riveted. Lovely stuff.